In 1998 a World Health Organization study seemed to indicate a prophylactic effect from second hand tobacco smoke in young children, reducing lung cancer by 22% , slightly beyond statistical insignificance and a slight detrimental effect in adults, not quite reaching the threshold of statistical significance at 16% . The report was accompanied by a press release from WHO that seemed to contradict the study. A political firestorm ensued, and the issue had remained highly politicized. The beneficial effect of smoke seemed unlikely and seemed to rely on a somewhat questionable stimulus of the immune system, likened to vaccination. Until this report, no other viable mechanism for a beneficial effect from trace amounts of smoke in the environment has been suggested. The second leading cause of lung cancer is widely believed to be radon gas, or, more precisely, radiation from short-lived isotopes created by the atomic decay of radon in the air. Radon is present in most structures around the world, originating from the decay of uranium and other radioactive elements in building materials, soil and rock. Unlike other radioactive materials, radon is a noble gas that is not bound in chemical compounds and readily diffuses through the solids to float freely in the air. The half-life of four days gives it plenty of time to find its way into the air, but four days is also short enough to give the radon gas in a room enough activity to cause problems. Radon doesn't stay in the lungs long enough to do damage since it isn't chemically reactive or electrically charged. But, when it decays in the air, the resulting isotopes are typically charged and chemically active. These radon "daughters" have relatively short half-lives and, hence, are very radioactive. When these compounds enter the lungs, they adhere to the tissues until they decay, typically releasing a radioactive particle, typically an alpha or beta, capable of causing tissue damage. Recent experiments appear to demonstrate that a small amount of smoke provides chemical partners for the charged isotopes, greatly reducing their tendency to adhere to other materials. Other aerosols do not seem to have the same beneficial effect so it is speculated that the ions or free radicals in the smoke are responsible for the effect. Radon daughters are easily collected from the air by drawing air through a filter. 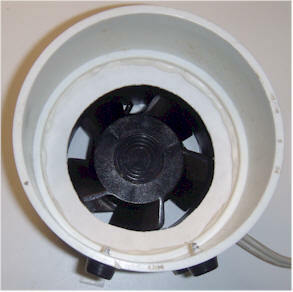 The collector below was constructed by mounting an ordinary computer case fan in one end of a 4" PVC plumbing coupler. 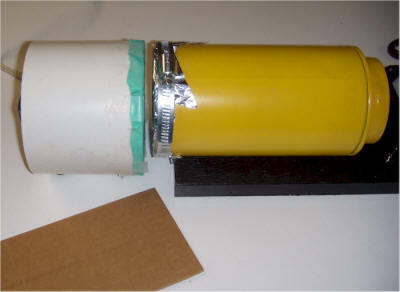 A white poster board doughnut is secured inside the coupler with some foam caulking to seal the gaps along the edges of the fan. 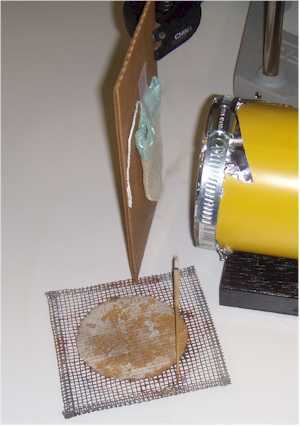 The fan is oriented to pull air through a filter paper affixed to the other end of the coupler with tape. 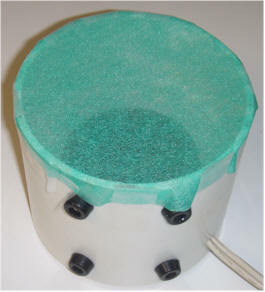 The filter in the picture is a piece of 3M SV-DF01 dusting cloth. 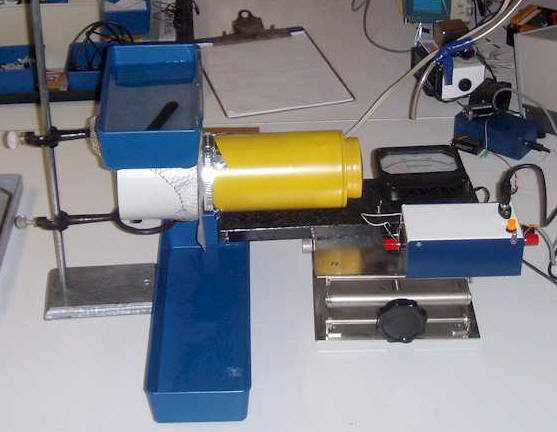 The desired isotopes will accumulate on the surface of the filter paper and their radioactive decay is easily monitored by placing a detector close to the surface. The detector used in these experiments is a home-made air-filled ion chamber. 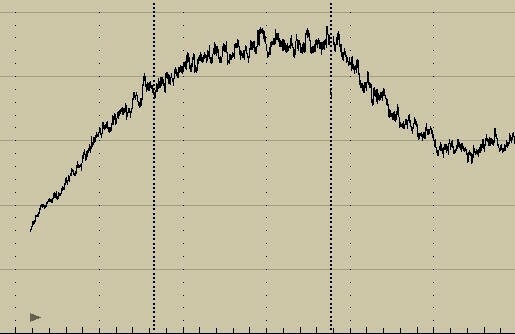 The vertical scale is 10 fA per division with the peak of the data just touching the 40 fA line. The horizontal scale is 1 hour per division. The output was relatively steady at about 15 fA when the chart was started. The fan was started at the first marker. The radiation exponentially approached a peak of about 40 fA, representing the equilibrium point where the decay of the accumulated isotopes equaled the rate of accumulation of new ones. The fan was turned off at the second marker. The radiation from the filter exponentially returned to the lower value, suggesting a composite half-life for the various isotopes to be about one hour. A lantern mantle laced with thorium was mounted in front of the chamber and smoke from an incense stick was allowed to drift directly through the gap. The concentration of smoke was much higher with this arrangement but virtually no drop in reading was noted due to the introduction of the smoke. The aluminum window blocks alphas, so the measured effect isn't likely to be due to the apparatus acting as a "smoke detector." The fan was started at the beginning of the plot and the familiar build-up of radiation to equilibrium is seen. The incense was lit at the second marker and was extinguished about 10 minutes later. The radiation drops for about two hours, then turns back up. There was only a hint of the incense smell at two hours. The growth of the radiation seems suppressed for several more hours. Although the data is qualitative, it does appear that the presence of a small quantity of smoke significantly suppresses the collection of radon daughters on damp filter paper (or blocks alphas from those daughters). To the extent that the filter paper models the damp tissues of the lung, this suppression suggests a possible mechanism for second hand smoke to reduce the incidence of lung cancer due to radon gas. The idea is that the neutralized isotopes are simply exhaled instead of building up in the lungs. A thin window with wire screen for electrostatic shielding will let in alpha particles. This would probably create a smoke detector, in essence, due to smoke's ability to block alphas. A commercial radon meter (SafetySiren Pro Series III) will be used alongside the ion chamber. Multicenter case-control study of exposure to environmental tobacco smoke and lung cancer in Europe. Boffetta P, Agudo A, Ahrens W, Benhamou E, Benhamou S, Darby SC, Ferro G, Fortes C, Gonzalez CA, Jöckel KH, Krauss M, Kreienbrock L, Kreuzer M, Mendes A, Merletti F, Nyberg F, Pershagen G, Pohlabeln H, Riboli E, Schmid G, Simonato L, Trédaniel J, Whitley E, Wichmann HE, Winck C, Zambon P, Saracci R.